Snap Engage - Best Live Help Software for your Website? Being a Live Support software company, Snap Engage teaches what they preach – they have online support agents online at any time! Well done! When you have successfully signed up for your free/trial account, the whole set-up process takes just few minutes. In fact, everything is already pre-configured for you! Just grab the code (HTML snippet) and add to your website’s source code, WordPress template or any other platform. Then, you can configure additional details in your Snap Engage account, such as the look of the button, operator accounts and other settings. Probably there are other similar solutions out there but what surprised me was the way the whole Snap Engage system operates – usually, you download a desktop application or login online to monitor website visitors and answer to live chat requests. Not with Snap Engage! There’s no desktop application to download! Snap Engage connects with your Skype, Google Talk or GMail account and uses them to run the application. So the way it works is – when you login into your Skype account or Google Talk, you’re now LIVE on your website too and when people start chatting with you, you’ll chat with them via Skype, Google Talk or GMail. Your visitors will never know this – they get a nice, shiny chat widget to communicate with you! There are some pluses and minuses to this set-up I’ll cover later on but one thing is for sure – it’s a very clever innovation and really simplifies the whole set-up process. What’s even more important – with a set-up like this, you can be online and answer customer chat requests wherever you’re – ON THE GO! You can use any mobile device (iPhone, iPad) and simply log into Skype to provide support to your customers without installing any additional software or desktop application. This is actually very cool feature, especially if you travel a lot. One of the main reasons I signed-up for Snap Engage account was their cool looking Pro-Active Chat feature. With this feature enabled (you can disable it whenever you want), software automatically introduce chat window to your website visitors after X seconds they land on your website.You can set this time delay in your Snap Engage account. Obviously, you don’t want to set this to instant or just few seconds as it may turn away your website visitors. This will hugely depend on the niche you’re working in but in general 30 seconds – 60 seconds should be the optimal time frame when pro-active chat window appears. You want to give your visitors enough time to browse around your website. If they stay on your website for more than 30 seconds, it’s a sure sign they are interested in your offer so that’s the perfect time to offer Live Support. With that being said, test Pro-Active chat option and see how it works out for your business. Pro-active chat will take a lot of your time as people will simply want to test whatever you’re actually a LIVE person or not! I activated Pro-Active chat and almost immediately started to receive chat requests! Many people just wanted to talk with me (mostly customers) or ask some questions, get advice etc. In a word – I was glued to my PC chatting for hours non-stop, lol! I tried this for a few days and realized that it’s not the most productive way to spend my day so I disabled pro-active chat option. When you do this, you’ll only get chat requests and e-mails/messages from people genuinely interested in your products or services. This may actually be the cause why I did receive so many chat requests as it’s pro-active indeed – many people started to chat simply to see – am I REALLY a human? So yeah, by changing this text to more passive form, I could probably eliminate large amount of unproductive chat requests. Skype/Google Talk/Gmail integration – it’s a great feature and will work brilliant for many people but I just didn’t like how it all looks visually. For example, with Provide Support chat system, you clearly see/monitor all visitors in a visually appealing way, because with Provide Support you have a desktop application. So this lack of standalone application is a plus and minus at same time – you get the mobility and freedom but miss all the additional features and visual look such installed operator console provides. In my opinion Snape Engage is a great Live Support software and I’ll actually continue using it for my info product websites and blogs. Only problem I see is the lack of downloadable software to manage chats (which on the other hand is a bonus). So I guess for some people it will be a plus, for some – minus. Snap Engage is definitely perfect for non-techie people as installation and set-up process was a breeze, unlike with LiveZilla for example where you have to know how to install data bases, use FTP and other stuff to install software. Free account option! Yes, there’s even FREE account option! With a limit of 30 messages/chat requests per month for this account but I believe for many newbies and start-up online shops it’s more than enough! I will most likely stick with Provide Support live chat service for my e-Commerce shops because of the desktop application but for info business websites will continue running some tests with Snap Engage! Thanks for the great review! We truly appreciate any feedback and will bear the dashboard idea in mind. 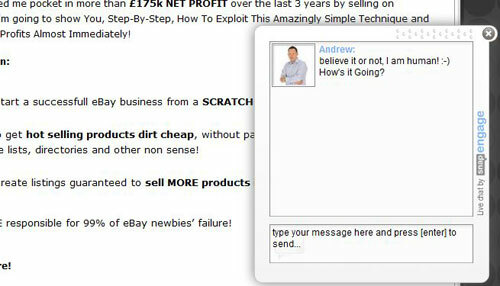 I did want to mention a feature of ours you might have missed you can use our chat directly in an Ebay listing! 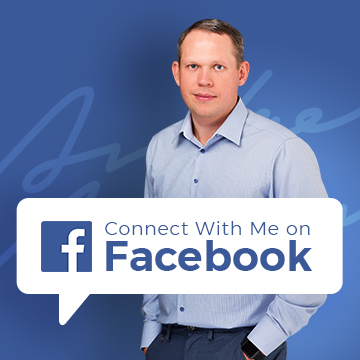 You can read up on it here http://help.snapengage.com/customer/portal/articles/91508 and you can enable us directly on a FaceBook page. Once again thank you for a really great review and let me know if we can ever help with anything at all. 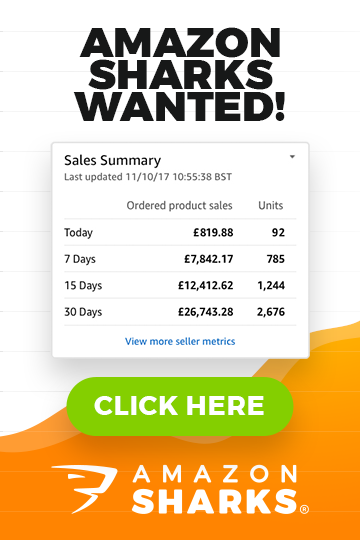 The eBay feature is great – that will be very valuable to many of my readers as most are eBay sellers. Andrew, did you look at other providers? BoldChat, LiveChat, LivePerson? They all have desktop apps. Thanks Simon – I know that there are other Live Chat software out there with desktop apps but I haven’t tested them yet (will keep these on the list for future reviews). 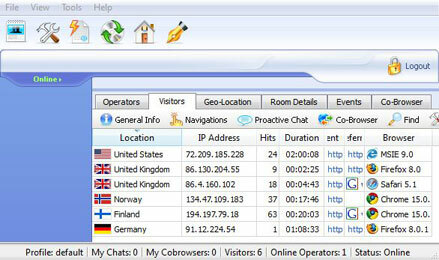 Live2Support is also one of the leading live chat software which is available for desktop. Android and iPhone. You should test it in the future review. But thanks for your recommendation.